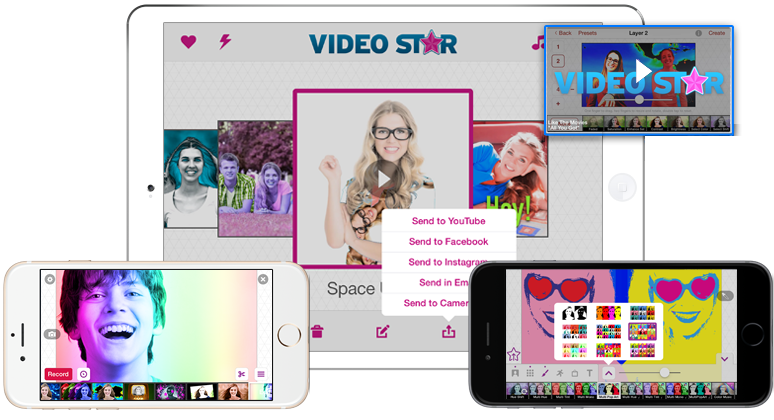 Video Star - you are the Star! The easiest, fastest, funnest way to make your own music video! Inspiration can strike anywhere, so capture it in a music video wherever you go on your favorite iOS device! Nothing to learn, no editing required. Just lip sync or dance for a perfect performance every time. One button YouTube uploads and easy Facebook and Twitter posts. Your adoring audience awaits! Das App ist einfach super ! This is great. I brought my iPad to school and my whole grade did a video. it was soooo funny best app ever!!!! And absolutely free!!!!!!!! This app us probably the coolest app in the wole app store!!!!! !TOTALLY GET It!!! Tolles App. Auf die schnelle lassen sich Videos mit Musikuntermalung machen. Keine Nachbearbeitung erforderlich. Finally, you can easily be your own video producer AND star in your favorite songs! Get this app! It is so much fun! You pick a song from your playlist and make music videos!! My friends and I just love to use this app. I tell everyone about it and after you get it, you will too! I've played with this app for 10 mins and already created 2 funny videos... Very easy to start with with what looks like lots of extra stuff to keep me playing... I am familiar with pc based amateur video editing and that's always been a laborious task.. This just works a treat.. And is great fun too! Ottima applicazione corredata di molti effetti,la consiglio in particolare a chi ama filmare. Simplemente me a encantado!!! Gracias!!! Love it if you don't have this app get it Now!!!!!!!!!!! OMG this is the best app ever¡!!!!!!!! I am obsessed. I love making fun videos with my friends on this app! Its so easy! Cada vez me gusta mas y aparte es gratis es increible me la paso todo el dia en video star lo amo!!! This is a really good app i'm using it all the time so yeah 5 stars!!!!! You should get it. Me and my cousin make awesome videos! Fantastica e semplice da usare !!! It's a great app I use it with my family ,friends, and all the time!!!! Hilarious!!!!!! Cet appli doit etre la meilleure apli de video sur Itunes. Il est tellement facile a utilisé et fait des clips video SUPER, il est incroyable!!!! Je l'ai eu gratuit mais j'aurait payer pour cette appli si il le fallait, il est vraiment parfait!!! Fantastic app, great fun with the kids making own music videos. A must have application, user friendly with excellent results! Fantastique tout le monde se marre . It's awesome! I can lip sync my favorite songs!!! Application très bien pensée et très bien faite. L'utilisation est aussi facile que le résultat est réaliste et drôle. Ergonomie, variété des effets et qualité sont au rendez-vous, et le plaisir est donc total. risas aseguradas haciendo el tonto delante del iphone jaja os la recomiendo! Super video app to play around with! Cette appli est vraiment génial je comprend ses🌟🌟🌟🌟 car ses une des rares sont les applications que je kiff 😍😍😍😍. Bravo à toute l'équipe !!! I love this app! Ive been looking for this forever!!!! And i finally have!!! Best app! !Absolutely love it!!! Semplice e funzionale ... Perfetta !! This is truly a fun app!! Best one I've downloaded this year. Fun, fun, fun!!! Han hecho un trabajo excepcional. La aplicación es buenísima. Evita trabajo posterior. Es uno de los dos mejores programas de mi iPhone. Fired up the app and within a couple seconds I was making my first video. Cool! Очень оригинальное приложение!!! Маленькая студиЯ! Хочется им пользоваться постоянно и много. Love this app! I really needed something to use to film a music video with, and this way Is way better than the ones me and my frien recorded with my webcam! I love it!! My sister and I can make cool videos!!! Great! But seriously this is the best video editing thingy i have seen so far. It's probably the best one! Just wanted to let you know I love you and this app!! This app is so awesome I like use it everyday I love it!!!!! I would recommend it to all my friends!!!! C'est une bombe encore mieux un tsunami de plaisir. Une super app ! Franchement bravo, rien à dire si ce n'est... Wawouh !!! I love this app! It is very easy to use. My friends and I have made several music videos to our favorite songs. I love this! Everyone should get this if you love music! You can be your own star with this! Lip syncing, effects, and more! Get this app! I love this app, definitely worth a download. Real easy to use as well as great fun. Thanks! Es increíble, padrísima, la mejor de edición de video sin duda nwn! Ich bin selber Produzent, Kameramann und Regisseur und dieser App ist wirklich genial gemacht! Great app! Also, the support is wonderful...you get a quick response! Can't wait for the next update! Rock on! It is indeed one of the best apps i've ever downloaded. Simply AMAZING!!! Easy to use, fun and exciting! Thumbs up for the brainiac/s who made this. A big THANKS! to you. Now I can take videos with lots of FXs. So fun!!! Def. recommend it! Отличное приложение! Дочь в восторге! Hey. Cette application es super. Je suis heureux de pouvoir l'utiliser. Merci encore et n'hésitez pas sa vaut le coup. This is the best app ever everyone should have it and if u don't then get it!NOW!!! wow this app is awesome!! me and my friend make videos all the time on it!! Complimenti simpatica e veloce ! Réellement fabuleuse. Excellente programmation. Bravo aux concepteurs. Il est très fluide avec un 4S. Merci pour tous les moments de plaisirs à suivre. Incredible display of video processing power from a $1 app. More fun than a $100 Adobe Premiere mac application. FAST, fun, my kids are just so amazed how fun this is. The ability to create custom filters just floored me. Omg love love love love LOVE this app! Incredibly easy to use and so much fun! Everything we recorded just made me laugh. Sweet! Complimenti! Applicazione davvero fatta bene! I looooooooove this app!!!!!!! I totally recommend this app! This app is so fun, have a play with two friends, family or a group of you! Use the effects to make you look like your from a different dimension in the future! Or just sing along to see if you can lip sink better than your favourite artist!!!! Отличное приложение - здесь даже можно создавать собственные эффекты! Рекомендую. Haven't scratched the surface of how much fun we are going to have with this app! I couldn't recommend it more get it now at 69 p it's a steal! And let all your family be video stars! Great app it works very well. A must buy! I have been looking for this app all my life😳😄. I ❤🎥🌟!!! Отличное приложение! :) Прtстор для фантазии! Очень интересно играть с цветом и формой, например сочетать рыбий глаз с хвостом от предметов. I love this app. It is amazing there are a whole lot of different effects you can use. I cant belive, what the app can. Its unbelieveble. I love it. Love it love it love it. Omg its like the best app ever.